Allowances received in accordance with ATO’s reasonable travel allowances are not required to be declared as income, and are excluded from the expense substantiation requirements. Reasonable amounts are determined by the Tax Office each year and released in updated Tax Determinations which are set out below, each of which include per diem rate schedules. Download the PDF or view online here. For the 2018-19 income year the reasonable amount for overtime meal allowance expenses is $30.60. The meal-by-meal amounts for employee long distance truck drivers are $24.70, $28.15 and $48.60 per day for breakfast, lunch and dinner respectively. The reasonable travel and overtime meal allowance expense amounts commencing 1 July 2017 for the 2017-18 income year are contained in Tax Determination TD 2017/19. For the 2017-18 income year the reasonable amount for overtime meal allowance expenses is $30.05. An addendum was issued modifying paragraphs 23 to 30 of determination TD 2017/19 setting out the new reasonable amounts, and consolidated into TD 2017/19 as linked above. For reference purposes, the first-released version of TD 2017/19 issued 3 July 2017 is linked here. 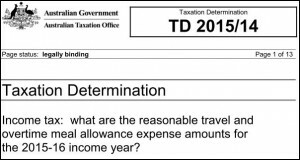 The reasonable travel and overtime meal allowance expense amounts commencing 1 July 2016 for the 2016-17 income year are contained in Tax Determination TD 2016/13. For the 2016-17 income year the reasonable amount for overtime meal allowance expenses is $29.40. 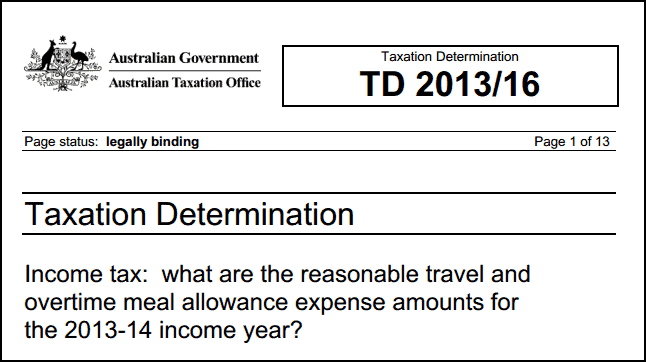 The reasonable travel and overtime meal allowance expense amounts commencing 1 July 2015 for the 2015-16 income year are contained in Tax Determination TD 2015/14. Download the PDF or view online here. For the 2015-16 income year the reasonable amount for overtime meal allowance expenses is $28.80. 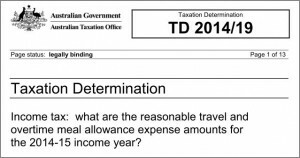 The reasonable travel and overtime meal allowance expense amounts commencing 1 July 2014 for the 2014-15 income year are contained in Tax Determination TD 2014/19. For the 2014-15 income year the reasonable amount for overtime meal allowance expenses is $28.20. The reasonable travel and overtime meal allowance expense amounts for the 2013-14 income year are contained in Tax Determination TD 2013/16. For the 2013-14 income year the reasonable amount for overtime meal allowance expenses is $27.70. Taxation Ruling TR 2004/6 explains the the way in which the expenses can be claimed within the substantiation rules, including the requirement to obtain written evidence and exemptions to that requirement. Allowances which are ‘reasonable’, i.e. comply with the Reasonable Allowance determination amounts and with TR 2004/6 are not required to be declared as income and are excluded from the expense substantiation requirements. These substantiation relaxations only apply to employees. Non-employees must fully substantiate their travel expense claims. Expenses for non-working accompanying spouses are excluded. Claims which don’t match the amount of the allowance need to be declared.